Last week I made the mistake of expressing my opinion about pending state vaccine laws on Facebook. I opened myself to a firestorm of opinions, of course, which I knew I would. But, what I never could have prepared myself for were the personal attacks. The ones that came through private messages instead of wall comments. The ones that accused me of not caring about my child. Now, I’m pretty fired up myself. Here’s what I want to understand: What is with this concept that only the ones who choose NOT to vaccinate are making a conscious, educated, thoughtful choice for their children? Why is it only the moms who make their own baby wipes and wear their kids until they’re 4-years-old and use a mortar and pestle to create homemade essential oils who get to say what a “choice” is all about? 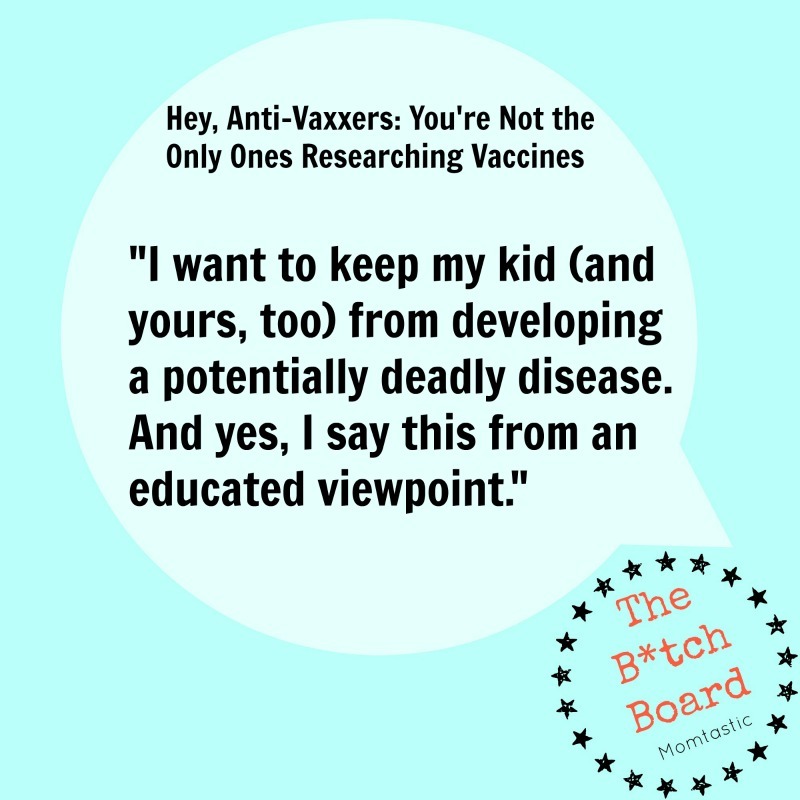 You might choose not to vaccinate your child now or ever, and I might think that’s ridiculous, but I am not accusing you of making a blind decision. Or of being a lemming. Please don’t do it to me. The fact that my husband and I vaccinate our child on the schedule recommended for healthy children by the American Academy of Pediatrics is a choice. We were not bullied into this decision. Big Pharma didn’t bang my door down and rip my angel from my arms and stick her up. No doctor shoved the concept down my throat and held my kid against the table to vaccinate her from the start. And we are not uneducated. Much to the contrary. I first became intrigued by the vaccine debate eight years before I had a child. At the time, I was interning at a magazine and I overheard one of the editors talking about a piece she was writing on a potential link between vaccines and autism (researchers later concluded that vaccines do not cause autism). I had babysat for an autistic child, and my interest was piqued. I hadn’t even met my husband yet. I was nowhere near thoughts of pregnancy when I first started digging into vaccine research. And I never stopped digging. The thing is, many of us parents have done our research. Many of us have read personal accounts like this one, studies like this one, and open letters like this one and this one before coming to the decision to vaccinate our children. Some of us, like me, are immuno-compromised due to autoimmune diseases and other disorders. I know what it’s like to be immobilized by illness. I am aware that there can be side effects from vaccines, like a temporary weak arm or low-grade fever. And more serious ones have occurred. But these rare and typically mild risks, in my opinion, do not outweigh the benefits. Far from it. I will do anything and everything to help keep my kid (and yours, too) from developing a scary, potentially deadly disease that should have been completely eradicated by now. And yes, I arrived at that opinion from an educated standpoint. You know what else makes me crazy? The accusation by these same anti-vax friends that we clearly don’t care about what my family consumes. Right now, we have our child on an organic diet. Of course, birthday cakes and dinners out mean that sometimes our child eats something that isn’t organic. But, we do as much as we can, while still affording to pay our grocery bills and letting ourselves have some fun with a special meal out that is not organic and GMO-free. Do not accuse me of being “trendy” by eating organic. 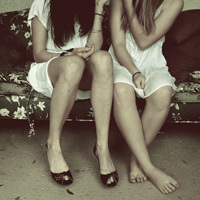 We do this at home and as much outside the home as possible. And yes, I am aware of the ingredients in vaccines. But, part of giving our child an organic, GMO-free base is that we feel more okay and less guilty about the rare occasions that something else gets in. Like a vaccine. While I strongly disagree with any of the other choices (delaying until school age, avoiding vaccines altogether), I would never go so far as to personally criticize another parent, label them, or attack them for being clueless. I get that you care about your child and want what you think is best. I do, too, though. Quit accusing me of falling victim to pediatrician bullying. Pro-vaxxers put just as much time and love into the choices we make for our kids as you do.